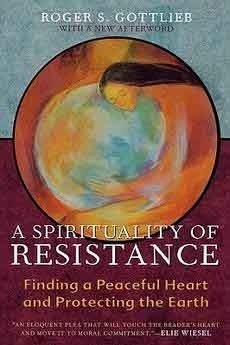 A SPIRITULAITY OF RESISTENCE: Finding a Peaceful Heart & Protecting the Earth by Roger S. Gottleib, Rowman & Littlefield Publishers, 205pp, $24.95. Whatever moves me out of pain is felt profoundly in my body, a filling up that precipitates tears. Whatever I love is loved with passion, also a filling up and the desire for intimacy, recurrence, return. Whatever is shared out into the worldly realm of dynamic, living otherness is shared with ardor—and breathes outwardly the warming and emotionally cooking element of fire, laying groundwork for communion, and possibly community. Can this fire of suffering or of love be contained by compassion, facilitate inner peace and harmony and also be present in service against wrongdoing? Can it emerge, even in emergencies, as acts of beauty that are not limited to aesthetic but are beautiful as the courage and humility of righteousness? Someone challenged me recently for focusing in a particular instance on murderous injustice: why so “limited,” I was asked, when there are so many opportunities for joy? Certainly I am not a joy denier and strive not to be a person in denial. My response was to point out that it is because suffering (injustice) and joy (the celebrative response of gratitude) are intermixed in this life; yet far too often, in our time, out of balance; compassion is of two entwined strands, contracting and expanding along an existential continuum. There is the compassion of compassionate affirmation, which embraces, would be innocent and recognized, and longs to be transported, if not indeed transformed, to ecstasy. There is the compassion of compassionate denouncement, which protests the absence of lovingkindness and justice, and resists those ideas and acts which lead rather to crimes against creation and humanity. To open oneself to the two ways of compassion is not more or less a limitation than is the human condition. This present volume I will speak of with my ardor, out of the kinship I have found in these pages and my bonding with the message, which I choose to stand with in Earth affirming and defending solidarity. Author Roger S. Gottlieb has a problem. He longs for an authentic spiritual that provides him an honest conscience and authentic peace of mind. But the real world surrounds him—a world of past, present and future. It presses in, and lacking the ability to will himself serenely deaf and blind, this real world, the world common to all, he experiences as far removed from honesty, authenticity and inner peace. Rather, it is oppressively entangled in crime and deception; guilty of genocide, guilty of ecocide, perhaps mad, perhaps apocalyptically suicidal. And yet Roger Gottlieb’s spiritual desire is so sincere he cannot be appeased by either the indulgent glow of narcissism or exiting via the presumptive elevations of an insular aestheticism. What then does such a person do with such a longing and such a problem? What does such a person do who would not betray either his life’s quest for the security that comes from inner peace—should we call this a search for meaning—or the challenge of the real world? The problem is hardly unique and certainly not exclusive. Yet the author attempts to answer the question posed, for he treats it seriously, and the response he offers is a spiritual of resistance. From this premise Roger Gottlieb moves on to consider the role of the consciousness of death—the fraught current of living consciousness, a positioned self-awareness, and the inevitable outcome of the termination of identity as a process of accumulation in time—the role of death then in the formations of civilizations, as acknowledgement, resignation, fixation, denial, or even systemic denial. I call this “wrong way” forced or premature death, brought on by either a violation of the integrity (and thereby the health) of life or by violence against life with an intention of destruction, with snuffing out, killing, rendering extinct. Gottlieb will use as references to this condition of wrongful death three dark touchstones—historical building blocks of a contagious and ever spreading hell on earth: the Holocaust, Auschwitz and the eye witness testimony of survivor-author Elie Wiesel. These important references notwithstanding, A SPIRITUALITY OF RESISTENCE is not pointedly a Jewish indictment against Nazi atrocity (as the author explains). The references are that, points of reference and, if you will, touchstones of evil, which Gottlieb would have us look beyond and look around, very much as if to say that fires of the camp crematorium burn in waiting in the nuclear arsenals of world powers as much as in the industrial flames voraciously consuming the Amazonian rain forest in humanity’s inhuman war against vital nature. Merely three pages later (pgs 27-28) there is this follow up: “In (the 20th century) liberation theology, religious civil disobedience as taught by Martin Luther King Jr. and Gandhi, and representatives of feminism and the environmental movement have modeled a spiritual of resistance. They have all affirmed that spiritual virtues involve much more than overcoming nagging anxieties or frustrations in our personal lives. As King put it, we are bound up in an ‘inescapable network of mutuality;’ and thus our personal spiritual development leads us necessarily toward concern for others. If none of us can be truly free while others are enslaved, so none of us can be truly enlightened or at peace if the fate of others is absent from our awareness. Responding to the environmental crisis, many thinkers have passionately extended that sense of mutuality and moral concern to our relations with the natural world. They have helped bring the depth of our pain for the environmental devastation to consciousness and told us that helping to heal that devastation is an essential part of our spiritual work. Certainly what is spoken of here, at least from a Biblical perspective, can be referred to as “the prophetic promise” (as set forth by Martin Buber and others). And in as much as this promise remains less than fully democratized throughout the entire human condition, it partakes of idealism, specifically a religious idealism; that is, an ideal, a quixotic achievement (should we identify it as a way of robust mutuality favoring a democratization of deliverance?). And while we have learned that idealisms and idealists can readily carry the viruses of political dangers, yet within the vision are the real seeds of maturity and responsibility, and the mutuality-call to cultivate gardens of the Earth—a way of living which our author reminds us is called Tikkun Olam: to mend or heal the world. How far away are the possibilities of this promise or how near? It is written (Talmud): Every life is a world. To save a life is to save a world. Not to save, when a life could be saved, is the same as destroying a world. Now let us agree that the groundwork for a spirituality of resistance in our time, according to Roger Gottlieb, is sufficiently laid out before us and move on to Part Two of the Gottlieb book. Returning here to the Gottlieb volume, the author refers us once more to the Holocaust; in so doing pointing us toward other anti-events of history, triumphs of the inhuman, past and present and overshadowing. .
Now, when author Roger Gottlieb has made his case, he sets about itemizing basic tenets of a spirituality of resistance. I cite but the first of these particulars. Then with simple eloquence, passion and truth-force power, we are told (p. 167): “I will resist is a cry of freedom.” Here too we encounter a recognition deserving to be acknowledged and explored. Yet, if there is, after all, a shortcoming to the Gottlieb argument, it is this (and the shortcoming may not be with the author but within the condition the author confronts in a mood of mutuality with us all): The Earth crisis and thereby the conditional crisis brought on through and within the human condition not only exceeds reason and our knowledge, but may well exceed the human imagination as it is within confines of dominating systems and mainstream paradigms. If so, then one must make a leap of faith—a leap into the unknown possibilities of inner evolution, embodied soul, and geopolitical application. This is to say, a person needs dare to trust that a genuine touchstone of healing and purpose is yet accessible and practically, existentially might be found or reclaimed and propagated with and through a spirituality of resistance. If so, what could be the purpose, the very worth of such trust—Camus might well have called any such boldness a wager—but that woven into the cosmic scheme this Earth and humanity as sentient and part of Earth is an achievement of goodness?. Shall we not say our goodness even in spite of ourselves? This question is a vital assertion of the core of the prophetic challenge, a way of turning toward and speaking out as old as Abraham contending against destruction for the corrupt and polluted Cities of the Plain—even for the sake of five. Thank you David for this thoughtful review. Much to reflect upon. I particularly liked the idea that without anger at injustice that prompts action and involvment to make this a a better world for all one has anasthesized oneself and runs the danger of losing one's humanity. This is a very insightful thought, especially when comparing Christianity with Buddhism.